The European Space Agency (ESA) has started a 50-million-euro initiative to bring together Europe's leading aerospace companies for the next four years. The aim of DevILS is to develop 'intelligent', lightweight spacecraft systems that ESA can use on future missions. Having these 'plug- and-play' systems will allow Europe to create lighter spacecraft that perform better. The traditional way to build a spacecraft is to make each one according to exact specifications. Just like asking a tailor to make you clothes, however, this can be an extremely expensive business. ESA has asked the European aerospace industry to find ways of taking a more 'off-the-peg' approach when building spacecraft. In this way, they will aim to reuse such systems on many different spacecraft. ESA has already taken the first steps towards this sort of reusage and proved that it saves time and money. For example, the recently launched Integral gamma-ray satellite reused part of XMM-Newton's design. Mars Express reuses hardware designed for the comet-chasing mission, Rosetta. The Venus Express mission is likely to use the same hardware design again. DeVILS is another way to save the taxpayer's money which uses 'intelligent' systems on-board satellites. An intelligent system is a multipurpose component that performs the same tasks as a number of previous units. In this way, you reduce the number of components and the size and mass of individual spacecraft as well, enabling cheaper missions. An essential aspect of the DevILS initiative is that, at this stage, ESA will not tell the companies involved what to build. After decades of experience, the European space industries are invited to demonstrate their creativity. Anton Linssen, Head of ESA's Science Management Support Office, says, "We have not given them any mission requirements. It's for industry to tell us what they want to do to make spacecraft lighter and perform better. We believe that this approach will allow us to harvest the good ideas for our entire programme, not just have them directed at a particular spacecraft." Linssen is confident that the initiative will stimulate the European aerospace industry to make satellites cheaper and lighter. This would definitely improve science missions but could well lead to better applications in telecommunications, global navigation, and Earth observation also. To achieve this, DevILS will urge aerospace companies, who usually compete with each other for business, to work together. "We think that having a combined proposal means they will propose things they see as having advantages in the commercial market as well as to us," says Linssen. 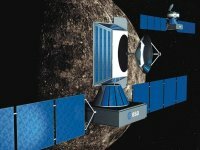 He believes that the first ESA mission to reap the rewards is likely to be BepiColombo.In the future, DevILS will allow ESA to make better use of the money at its disposal. Linssen says, "With the money we have, we want to fly as many missions as possible and deliver maximum value for money to the scientific community. Lighter intelligent systems reduce total mission costs so perhaps we can launch more missions. Alternatively, we can add more experiments to spaceprobes. Either way, we get more science." The companies involved in the first phase of the DevILS initiative are Astrium (France-Germany-Britain), Alcatel (France), and Alenia Spazio (Italy), as equal partners. Also involved are Saab Ericsson (Sweden), Dutch Space (The Netherlands), SENER (Spain), and Contravenes (Switzerland).